It's another M&S post - sometimes brand opportunities are like the buses. My Holly Willoughby posts come via the manager in my closest store and these regular collaboration posts come via a third party who work closely with the brand so now and again the dates end up being quite close together. It's a good fit though - both for readers and for me...it's the shop that gets the majority of my business over the course of a year outside of the blog. 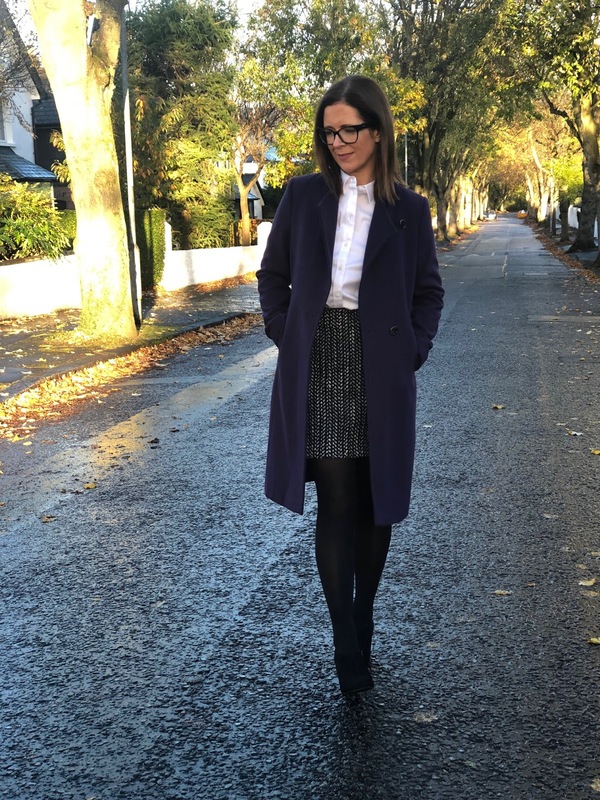 So the challenge I was set for this project was to create a capsule workwear wardrobe for £250. Perfect timing as I'm working in a more formal office environment 2-3 days a week now and I have had to up my game in the workwear stakes. 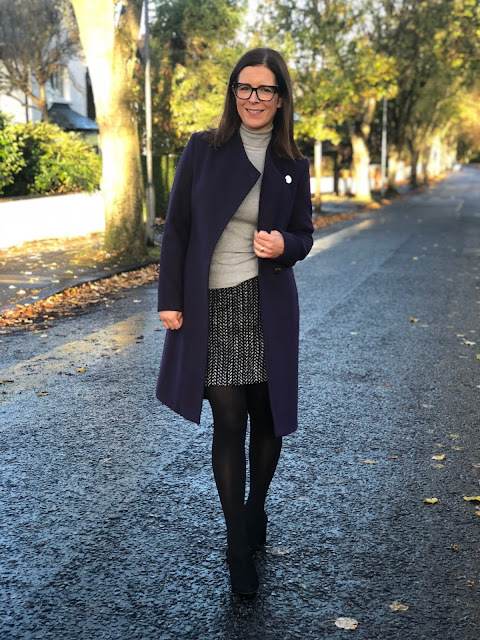 I decided to start with a jacket I spotted on an M&S post a couple of months ago and loved. It's got a matching skirt and I knew it would work well as a base for the capsule. 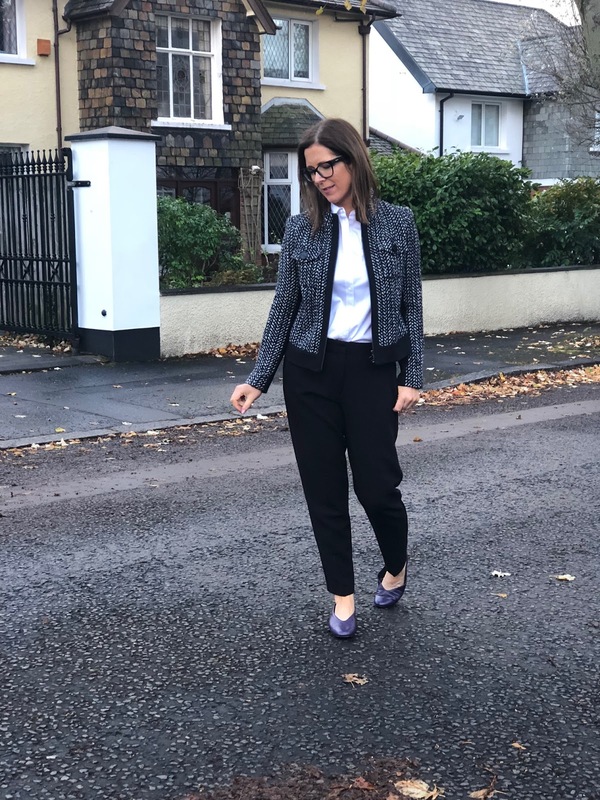 This jacket is a winner - it can be worn dressed up or down (I wore it with jeans last week) and I like how it's work appropriate but not a boring suit jacket style. It's a little bit edgier with the zip closure and black trim. The skirt is short so make sure to wear it with 60D opaques. These ones are from M&S too - a staple in my wardrobe. I buy a couple of pairs every winter. 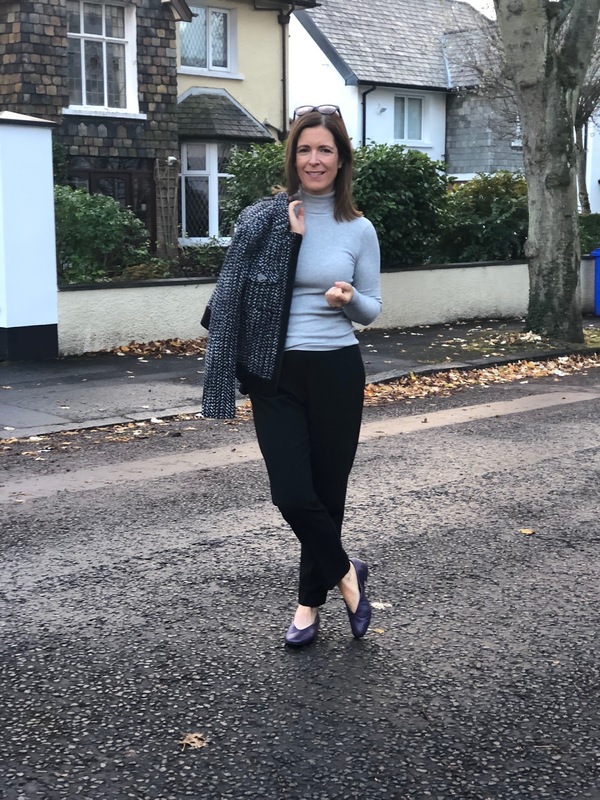 And I've matched the suit with one of the M&S roll neck knits - brilliant for offices where you might be freezing one moment and warm the next. They're just the right weight. Add a coat...my colour pop for this workwear capsule is purple and here is a purple coat you CAN actually buy online now....and I'd argue that it's more wearable than the lilac one that everyone is standing by to pounce on when it goes live on the 13th November. 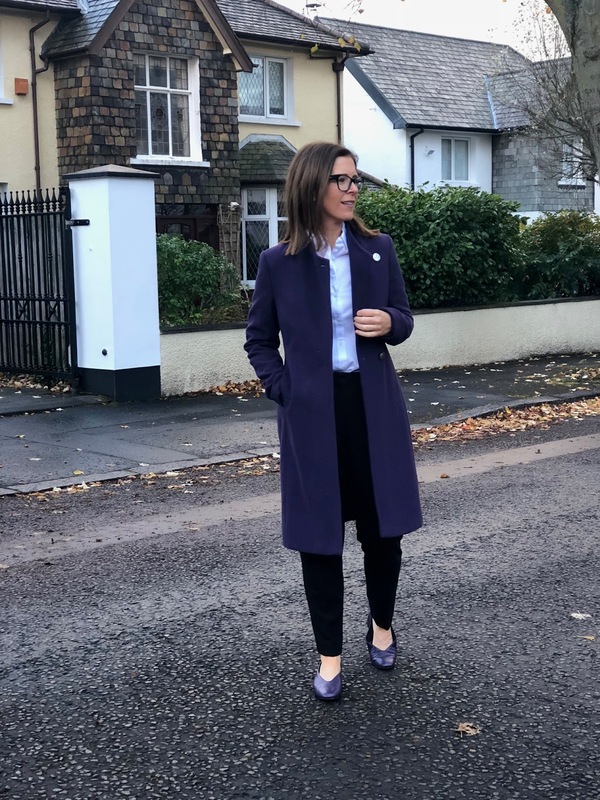 This one is such a great fit, a much more wearable shade of purple and it's just £59. Like most M&S coats - I sized down to an 8. Then swap out the grey knit for a white shirt on cooler days or if you want to look just a bit more formal. 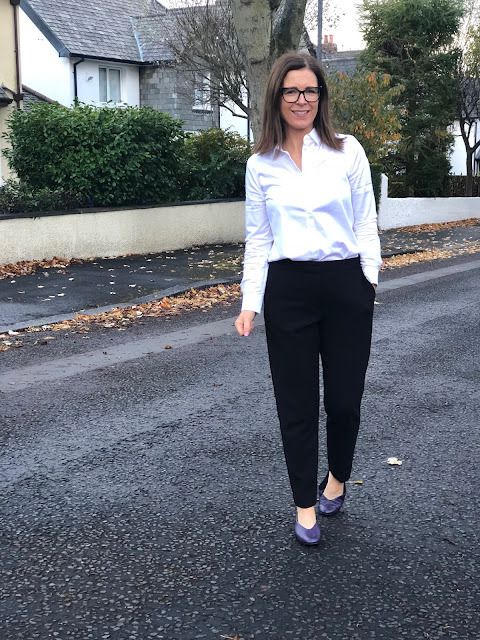 These white shirts are £25 and are my 2018 white shirt pick. Gorgeous fabric, a proper bright white and with non-gaping button closure. All the ticks for £25. I always like to know the back story to blogger photos...these ones were taken while a tree surgeon company were working on my neighbours fallen tree. They took great interest in my running in and out of the street for different outfit shots. I was MORTO. So much so, I forgot to take a close up of the shoes. They are workwear heroes. Literally everyone who has asked me about workwear since I started back in a 'proper' job, have lamented footwear. It seems to be the hardest thing to get right because no one wants to be tottering around in heels...we're all too busy for that shizz. I have always been what I'd describe as a 'stomper'. I don't walk nicely like women should...I stomp. Very fast. I simply can't do any kind of stiletto heel but I don't have long legs. 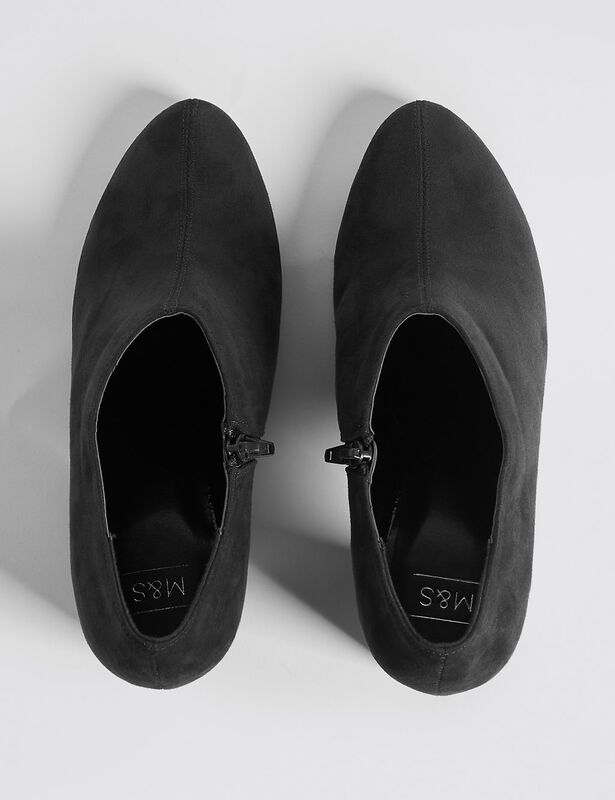 So a flat shoe, while it works with trousers (see below), doesn't work with a skirt for me. And then I found these ones...while trying on every black shoe in M&S. They look like nothing off your foot. I'd say they're borderline nana shoes (see more below) and I would never wear them outside of a work scenario but do you know what? They are flipping amazing. Because they're suede, they blend perfectly to the leg giving you inches more length. Don't be put off by the look of them. Try them on and see you legs get longer...feel the joy of a bit of height and then see how well you can stomp in those block heels. I think they are the holy grail of work shoes. add the checked jacket in again..
And this last outfit is exactly what I wore to work today. I can walk to the office in about 20 minutes and these shoes are like walking on air. I'd add a pop sock for cooler days though today was 5 degrees and I still went bare ankled. It's not for everyone - I don't seem to feel the cold on my ankles like some people do. This capsule has been a lifesaver for me for work over the past week or so. I have mixed and matched it since it arrived and it's made my mornings so much easier. You can add in items you already have like a black crew neck or a cream blouse but as it is, it creates 4 or 5 different looks for each week. What's not to love about something that gives you a bit more headspace of a busy morning. Thanks to M&S for the opportunity to work on this post. It is part of my regular collaboration with the brand. I chose all of the items myself and the words are all my own. My links are affiliate links so that M&S can track any sales back to this website and they will pay me a tiny commission if you buy and keep an item. This doesn't change the price of any item for you and the modest income I make from these links help to cover the running costs of this blog. Great coat; like one of the Ted Baker styles this year but without the cost. Hi Avril, great post, I love everything esp. 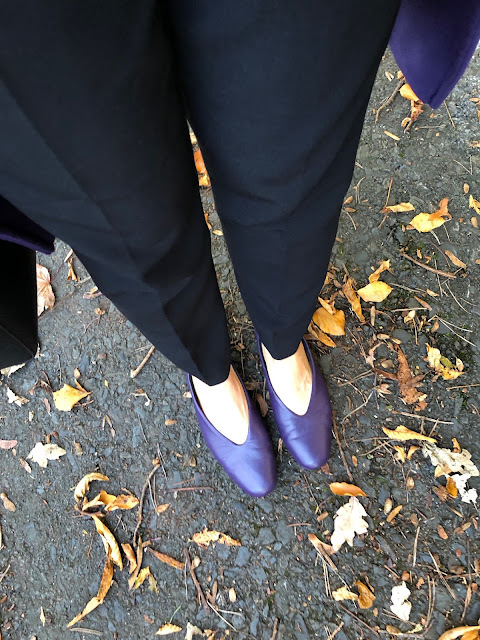 the purple ballerina pumps! I am off to order them now! The coat is also fab but unfortunately that length doesnt suit me I feel.